Your Sports Live is a website to watch many sports events. Click HERE to check it out. It will also play live NHL games and also has a replay option. The sports website allows you to watch many sports events including, NFL, Hockey, Basketball, and more. You can watch the game in either Dual or a Quad stream so you can watch up to 4 matches at the same time in the same window. The website also offers many of none sports channels such as AMC, Animal Planet, Bravo, BBC and much much more. The website has some movies too, you can do a quick search to see what is on offer. 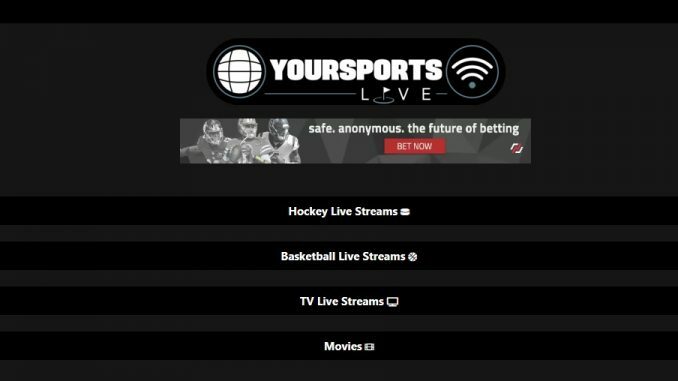 Your Sports Live is a website is a great way to watch sports and other live tv channels. When we find the channel we want to watch we can then hit the big play button and the channel starts to stream.There is also a chat box on the right side of the screen if you want to join in with the community. Can dual or quad stream in the same window. The playing window has a volume control and bitrate changer. Has some movies and includes a search.